Interesting article in last month's Fast Company about the shifting usage of technology terms and what is becoming the new normal for how we talk about all things geeky. "Job titles are an obvious example. Over last couple of years new roles for geeks have come into existence within agencies: content strategist, social media something, creative technologist, user experience designers, developers, digital ninjas and chief technology strategists, [ahem] to help us service the growing need to understand and connect to consumers enabled by technology. " The article goes on to describe how technology is at the core of this year's award winning projects from the communications industry (formerly known as advertising). When I first started working on Web content projects, I found that the clients and agencies that really understood the value of having a structured and planned content strategy were the ones who had recently gone through a nightmare project. All it usually takes to understand why content strategy is important is one really embarrassing project where the content is either late, completely wrong in voice or tone, or completely wrong for the design. 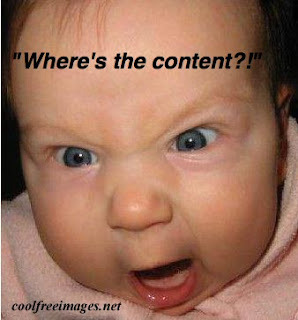 Getting content strategy added to the project plan and staffing plan for these clients is usually an easier sell. 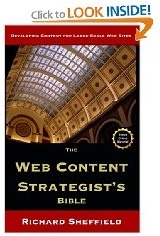 Content Strategy is all the things you should have done so that your content would have been useful and on time. A couple of months ago I published a mind map showing all the facets of content strategy that was very well received. Since then, I've had many requests for better access to the files. I tried in vain to make use of the free online software I had originally used to build the map, but eventually I had to give up and rebuild the entire thing using the iMinMap tool. It took a while, but I think the result was well worth it. Free download of the JPEG files - There are two versions of the mind map that you can just download (one with a white background and one with a dark background.) These full-sized files are distributed under a Creative Commons license so feel free to use them however you wish as long as you don't sell them. Purchase a printed poster - I took the JPEGs to Kinkos to get a printed version and was surprised at how much it cost. It was actually cheaper for me to set up page on Zazzle.com and have them print them for me. They print on heavy card stock and do a good job. So I've opened this page up to everyone who wants to get a printed version. 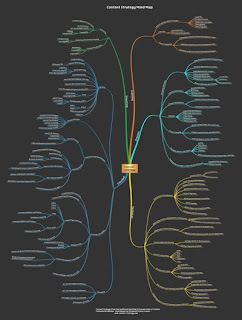 I've also given the content strategy mind map a more permanent home over on Web-Content-Strategy.com.